My wife and I took a trip into Essex a week ago, on another of our Genealogical expeditions. Spotted this specimen in a churchyard there. Nowhere near as old as the Yew picture I posted a few weeks back but still interesting, I think. 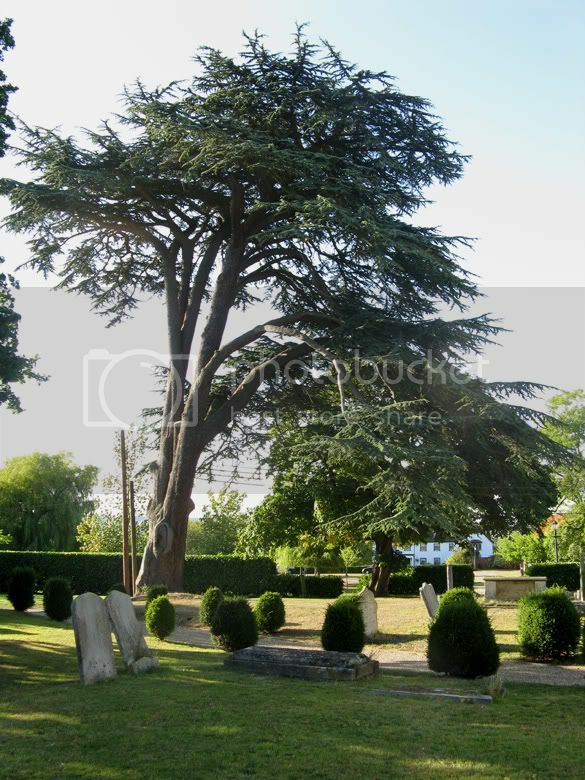 It looks to me like a Cedrus (true cedar), like the cedars of Lebanon. My guess would be more than 200 years old. Well, that's my guess and I'm sticking to it. What the heck do I know about trees other than they make boards. Bent Cedar, 500 years old. That is not Yew tree is it? I thought yew lived in another part of Britian? You are 100% correct Mango..... that's NOT a Yew Tree. It is purported to be a Cedar of Lebanon planted in the 1650s... at least that's what it says in the church. I posted this on my British forum and some though it might be Cedar Deodara or Cedar Atlantica. It was pointed out that sometimes Cedars other than Cedar Lebani were sometimes referred to as 'Cedar of Lebanon' because of the Biblical implications. I didn't think it would spark such a debate! So that would make my entry pretty close to the mark, no?